I am somewhat addicted to the Young House Love blog. If you don’t subscribe to this blog, you should. Sherry and John Petersik take you on their journey as they make their house a home. What is especially nice is that I can actually do some of the DIYs and a great majority of them fit into my budget. On occasion, they also do a “home crash” where they visit someone else’s home and allow us to come along. 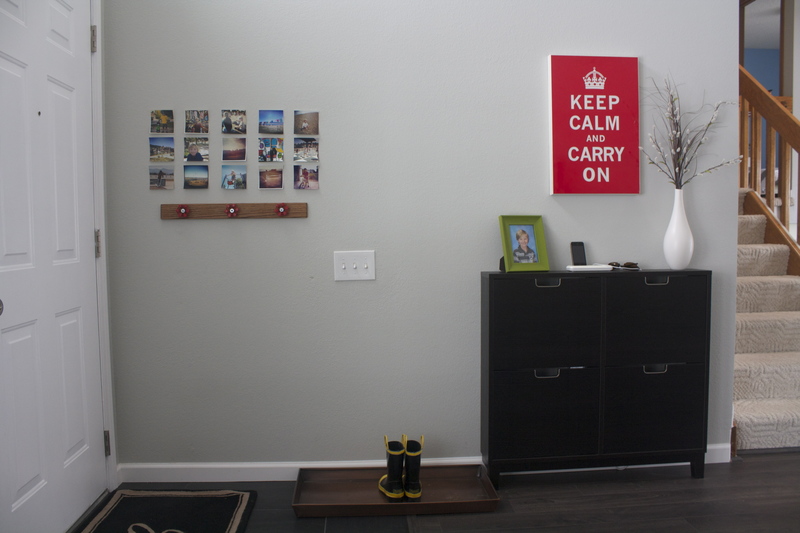 Via one of these “crashes”, I fell in love with this simple coat rack. I do not have the luxury of having a “room” for an entrance, but I do have the need for a coat rack. You see, since moving to Colorado, our house is usually filled with at least one of my son’s friends. They have a boot tray in which to place their shoes, but coats always end up on the floor by the front door. So…. I took a trip to the Home Depot and purchased a piece of wood and 3 water valves. Some may say that I am a little lazier or a little more impatient than the designers who spray painted the valves in the above mudroom. I call myself lucky because I found some valves that were already red, and they were less than $2 a piece. I stained my piece of board with some Oak stain to match the existing woodwork in my home. I then (well, the hubs) screwed the valves onto the board with wood screws and washers. It then got attached to the wall. Not as elaborate, but simple and useful. Have you been inspired by someone else’s project but made little tweaks to make it your own. I love projects that are simple, inexpensive, but end up being extremely functional. Again, sometimes it is just the little things that make me smile. Hey! I love your blog! It is so awesome! Yay for you for starting one!!! The layout is so simple and cute! Did you do it yourself or hire someone? Mine needs a serious face-lift. I never loved it and one of my blogger friends lovingly told me that it doesn’t fit me at all. She called it scrapbooky. She was right. Can’t wait to read more of your posts! Amy, thank you so very much for the compliment and encouragement. It was you who got me motivated enough to stick my neck out there in the blogging world. Any advice or suggestions would be greatly appreciated.